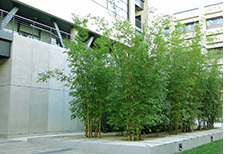 Providing a wide selection of dependable tree and bamboo barrier products. Bamboo rhizomes are the roots of a bamboo plant. Bamboo rhiozomes grow at a remarkable rate and can cause damage to surrounding hardscapes and plantings if left uncontrolled. We offer a comprehensive selection of HPDE rhizome barrier to suit any bamboo control application. With material heights ranging from 18" all the way to 48" and in thicknesses from 30 mil to 80 mil, we are able to equip you for virtually any bamboo containment project on your agenda. Many homeowners plant bamboo in their yards and want to ensure that the bamboo is contained to their own property or to a specific section of their property. We are more than happy to help homeowners make the correct barrier selection for their bamboo-related projects. If you are a homeowner with questions regarding your future installation please feel free to contact us. We supply rhizome barrier material to many contractors and municipalities acroos the United States. We offer volume pricing for large projects and can provide a custom written quote for our material. Trimming the ever-growing rhizomes is really the key in controlling the growth of the beautiful bamboo plant. Removing its canes and shoots above its ground level does not stunt the bamboo's growth, it is beneath the surface where the real growth is occurring. One technique to help the gardener spot and neutralize growing bamboo is to dig a trench around the plant so that bamboo rhizomes (roots) can be spotted and clipped before “jumping” the trench. This method is effective if the trench is deeper than the bamboo roots and if the gardener is working in the garden on a daily basis. Bamboo can grow very fast and even outpace even the most attentive and meticulous gardener. Although fairly effective, an open trench is not ideal for most landscapes. Open trenches can be unsightly, can fill with water and can provide trip and fall hazards leading to sometimes serious injuries depending on the depth of the trench. Another option which is very effective in controlling the growth of the bamboo rhizomes is to install a bamboo barrier. Bamboo Barrier is very helpful in curbing the growth and spread area of bamboo. It constructed of of a high-density polyethylene (HDPE) and typically measures anywhere from 18” to 48” in height with a recommended thickness of 60 mil to adequately stop bamboo roots. For most applications a recommended barrier height typically ranges from 24” - 36”. It is usually sold in 100 foot rolls and can be cut to the desired length with a standard utility knife. Installation of the barrier is fairly straight forward. First, dig near the bamboo plant to determine how deep the existing roots extend into the ground. Once the depth of the roots is determined it is recommended that a barrier is chosen that is approximately 12” deeper than the depth of the bamboo roots. For example, if the bamboo plant's roots extend 18” into the ground a 30” barrier should be chosen. The reason for going deeper than the existing roots is when the barrier is installed the roots may angle downward attempting to go around the barrier. Although the roots are much more likely to extend upward there is a chance that they could go down. 12” of extra depth on the barrier provides more protection and greatly reduces that chance of the bamboo roots going under the barrier. Once the appropriate height of barrier has been chosen, dig a trench around the bamboo planting area with a depth that is 2” less than the height of the barrier. For example, if you are installing a 30” barrier, dig a 28” trench. This is to allow 2” of the material to stick above the surface forcing any bamboo rhizomes which are inclined to “jump” the barrier to surface and jump up and over the barrier. The gardener will then have a visual of the jumping rhizome and will have a chance to clip as necessary to prevent spread of the plant. Cut the material to the appropriate length, place the barrier in the trench and be sure to overlap the material 4” at the seam to make a complete circle. Use HDPE seam tape to secure the two pieces together. Finally backfill the trench around the material. The bamboo planted within the barrier area will now be well contained and if the roots are trimmed properly will not leave the designated area. If you have any questions regarding our bamboo barrier products, installation or applications feel free to give us a call at (800) 351-9633.